When driving around Malden, MA and the service engine soon or check engine light appears on your dashboard, get it checked ASAP! Also know as the "Dummy Light" to tell you to seriously get it diagnosed soon rather than later. Your vehicles computer system does a great job telling you that your car has a problem, give us a call, and our mechanics will work to diagnose the problem is and the best way how to fix it. Don't delay getting it checked because the problem could become a much bigger problem the longer you wait. Call at (781) 321-0880 to schedule an appointment today! Our Malden, MA shop provides emission testing, one of the most frequent reasons check engine lights go on. Part of our diagnostics we will preform an inspection of your vehicles emission system making sure its up to date and within the guidelines of the Mass state emission codes. Here at Gary & Eli’s Automotive Services we are a full service auto diagnostics, repair and maintenance shop. We specialize in engine diagnostics, tune-ups and maintenance for cars, trucks, vans and SUVs throughout the Malden area, and for your convenience we are open 6 days a week. We offer the best Check Engine Light Malden, MA residents can rely on! 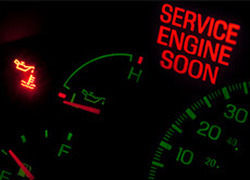 So if your check engine light is on, call us today at (781) 321-0880 and have our experienced mechanics take a look. The quicker you come in and see us, the quicker we can get you safely back on the road.